What Can I Do with a Master's in Elementary Education? Note: This page provides information for a Master's Degree in Elementary Education. For overall information on elementary education programs, please see our Elementary Education page. Those who seek a Master's Degree in Elementary Education typically want to advance their careers in the field of education. Many want to master their craft in the classroom while others want to become teacher leaders or administrators. In general, the longer a program has been around the better. Do keep in mind that online learning is relatively new. With that said, you will not see online programs that have been in service for decades. However, if a school has not been around long enough to gain full accreditation, you might want to reconsider. Online schools use virtual classrooms as a way to facilitate instruction. These online learning platforms allow students to access assignments, communicate with peers and instructors, view multimedia lectures, and submit assignments. 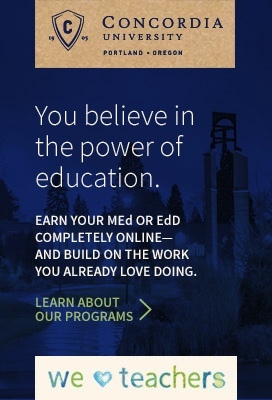 Not all online programs use the same learning platforms. With that, it may be a good idea to preview the technology prior to signing on board. Students services, such as resources, are a very important part of a college experience. Resources are tools to help you with your schoolwork. This may come in the form of online catalogs, technology support, advising, access to scholarly journals, multimedia libraries, and more. Resources help students succeed, so it is a great idea to learn about what will be available to you before signing on. A good online Master's Degree in Elementary Education program should be able to provide a clear and concise curriculum upon request. These learning goals and outcomes detail the knowledge and skills that will be acquired as part of the master's program. See how the program goals line up with your personal and career goals. Alumni students are great resources. These recent graduates can act as career counselors and mentors. See how an online Master's Degree in Elementary Education has helped real people with their career. If given access to alumni, be sure to ask question about the program and what you can do to maximize your experience. Since online degree programs can be taken from virtually anywhere, students are able to have a wider range of schools and programs to choose from. Traditionally, students would need to consider geographic location and proximity to a college or university before starting a program - that is not the case with online schooling. One of the most commonly noted upsides to online Master's Degree in Elementary Education programs is the flexible time schedule. Since weekly physical attendance in a college class or lecture hall is not required, students can complete their coursework whenever and wherever. This is especially great for students who have jobs and those who have families to care for. Online instructors usually post lecture videos to web portals. Students will then have the option to view the video on their own time. Online students can do their assignments and watch lecture videos early in the morning before work, on a lunch break, or late in the evening after dinner - whenever most convenient. Online schooling has taken away the fear of missing classes due to family obligations or work restrictions. Financial aid is available for online Master's Degree in Elementary Education students. Federal student aid through FAFSA is available for those who qualify. Additionally, many states offer grants and scholarships. Some schools may even offer grants and district level loan forgiveness to teachers who agree to work in low income schools for an established amount of time. There are many accelerated online Master's Degree in Elementary Education programs. These online programs allow students to finish degree requirements in a short amount of time. Additionally, most online programs do not require students to stick to a strict semester schedule. That being said, online students can take classes simultaneously and back to back - allowing them to complete more in a shorter amount of time. A Master's Degree in Elementary Education typically allows teachers to advance on the salary scale. Many districts will allow this to be the basis of becoming a school administrator if working on a higher degree or other certifications. Educators with a Master's Degree in Elementary Education may also become directors of elementary programs, educational specialists, coordinators, coaches, specialists, department heads, and more. Another way to excel in this field is to join professional associations or organizations. This is a great way to network and stay updated with current research and finding regarding elementary education. The National Education Association, for example, is the nation's largest professional employee group. The NEA is dedicated to advancing public education. In order to support growth in the field, they hold conferences, seminars, and training programs.